Sweet Itch is a serious, self-perpetuating medical condition affecting horses and ponies everywhere. The condition is more prevalent in warm regions and during the months of spring, summer and autumn when midges are most active. That said, Sweet Itch can strike anywhere and all it takes is one bite from an offending midge to onset severe symptoms. Otherwise known as Summer Itch, Seasonal Recurrent Dermatitis (SSRD) or Culicoides Hypersensitivity, Sweet Itch is caused by an allergic response or over-sensitivity of the immune system to the saliva of the Culicoides midge. When bitten, proteins present in midge saliva can prompt uncomfortable immune reactions in horses. By way of comparison, equine hypersensitivity to midge saliva is like human sensitivity to pollen in hay fever sufferers, but with the added potential for infections. How will it affect my horse? Sweet Itch is distressing to witness as an owner, with affected animals often rubbing themselves raw for relief from the pain and irritation. In susceptible horses, the immune system over-releases histamine in response to foreign saliva, causing the skin to become itchy and inflamed. This results in excessive rubbing and self-trauma biting of swollen lesions, perpetuating the condition further and leading to some serious infections where the skin is broken. The areas worst affected by Sweet Itch are the mane, tail and dorsal midline, which can be easily reached with the teeth. The neck and hind end are perfectly placed for being rubbed against fence posts and trees, while rolling on the hard ground also alleviates some itchiness, to the detriment of the coat and skin. Occasionally, Sweet Itch will appear on the underbelly, the ears and around the face. It is more common in certain types of horse such as the Icelandic and Welsh Cob, with Thoroughbreds being less affected. How can Sweet Itch be treated? Once Sweet Itch has taken hold, treating the condition and bringing effective relief is difficult. The more a horse itches, the more it rubs and bites itself, and thus the more it itches. The best method of defence is prevention with Sweet Itch, although no measure is entirely fail-safe and many have side-effects. Steroid drugs prescribed by the vet to help manage severe cases of Sweet Itch have been linked to higher incidences of laminitis, something to bear in mind when considering this treatment. Where the skin has been broken or rubbed away, preventing skin infections is a top priority for horse owners. Applying repellents and insecticides such as benzyl benzoate to affected, unbroken areas has been proven effective to some extent, although there are limitations to these (such as not being weatherproof and needing to be regularly re-applied). Citronella (as well as tea tree and garlic oil) has long been thought of as a soothing and protective remedy against biting insects and secondary infection, although its effectiveness is disputed. Midges hate having to feed through layers of oil or grease, but they are not completely deterred by it. In short, there are many ‘treatments’ on the market, but handling Sweet Itch is not so straightforward. Some people swear by herbal remedies, garlic supplements, certain high-fibre feeds and medicated shampoos, but all horses are different and will not react the same to interventions. VioVet stocks a range of coat and skin supplements, including Dodson and Horrell 'Itch-Free' which contains a beneficial blend of herbs including burdock root, chamomile, nettle and garlic, known for their repelling, soothing and healing qualities. Global Herbs also offers a range of anti-itch supplements and liquid formulas for helping to manage the effects of Sweet Itch, such as their Skratch Plus and SuperSkratch products containing carefully chosen, digestible herbs. Before choosing a supplement for your horse, it is worth talking to your vet and discussing your options. Combining preventative supplements, barrier protection formulas and medicated ointments with a practical and effective rug and good common sense is probably the best and only way forward in the fight against this stubborn and debilitating condition. As midges are most prevalent in areas near water and woodland, always make sure susceptible horses are kept well away. A windy hillside is ideal for repelling midges as they cannot fly in winds exceeding 5 m.p.h. When stabled, provide a fan that keeps air circulating and prevents midges from entering and feeding. It is advisable to keep horses stabled at dusk and dawn (6pm to 8am) when midges are most active. A fly screen above the stable door will help prevent biting insects from passing through. 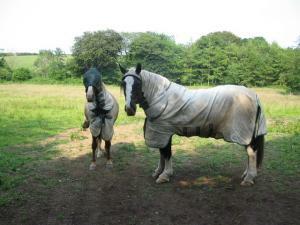 If your horse is susceptible to outbreaks of Sweet Itch, investing in a quality fly rug for when he/she is out grazing during spring and summer months will help keep midges off the skin, mane and tail. A rug that extends over the dock and part-way down the tail is great for restricting midges and keeping them away from problem areas. The head, ears and mane are also vulnerable to the attentions of biting insects and need covering as much as possible. A rug that extends along the neck, over the ears and part-way down the face will keep out midges and protect the delicate eyes from irritation. VioVet sells several fly rugs, including the Z-itch rug with hood that not only protects against midges but absorbs powerful UV-rays and allows air in to circulate, keeping your horse at a comfortable temperature whatever the season. The rug also incorporates a mesh eye section, is fully-adjustable and is machine-washable for convenience. Ensure the rug is worn in the lead up to summer, before any signs of Sweet Itch are first noticed. Putting it on once lesions have appeared is futile as your horse will continue to itch itself, only destroying the rug in the process. Sweet Itch is a terrible condition for both horse and owner and there are few solutions once hypersensitivity has begun. Spring, summer and autumn months can be miserable for horse sufferers whose happiness and health is compromised by these small but mighty Culicoides midges. Prevention is key, as is minimising the harm your horse can do to itself through repetitive itching and scratching. Electric fences rather than wooden ones will help to some extent, as will where you graze your horse. Finally, before buying a horse, always check for signs of Sweet Itch. During winter, symptoms of the condition disappear along with the midge, making it more difficult distinguishing the afflicted horses from the rest. After a bad bout of summer Sweet Itch, some horse owners may decide to sell their horse on and winter is often when they do this. Keep a lookout for hair loss on the mane and tail and scarring on the croup and withers, as these are sure signs of previous outbreaks. Getting a professional opinion before purchasing is a good idea as you do not want to find yourself stung with large veterinary bills when you later discover your new horse is a Sweet Itch sufferer. If your horse is insured and develops Sweet Itch further down the line, your policy should cover the condition. If you have any advice to share with our readers, please post your comments below. Also, if you have any experience of owning a horse with Sweet Itch, it may be helpful for others to hear about :) We hope this blog has been useful.